In the medieval land of Hafne, a curse has swept through the land leaving it barren and without hope. As one of the chosen, Vala watches for signs of the prophecy and with it, the owner of a ring who is destined to fight by her side and drive away the darkness. The newly arrived Norman enemy is an unnecessary complication in Hafne—and in beautiful Vala’s heart. Giles arrives with his Norman men in time to rescue a mysterious woman from a watery death. Holding Vala in his arms, the stirrings of destiny and desire begin, binding him to a prophecy of which he surely wants no part—binding him to a search for his true origins and a fight to save his soul and hers. "RING OF DESIRE is a dark, dangerous fantasy with the ultimate goal of fulfilling destiny and saving the world. 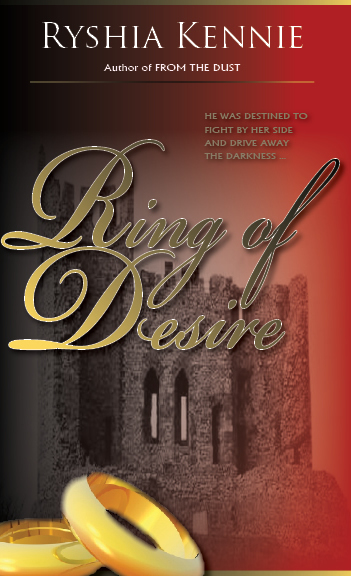 RING OF DESIRE is also all one could ever hope to find in a romantic tale, with evocative passages of love, the emotion, as well as more physical attraction... It is impossible not to be moved by Vala’s plight, and we will hope against hope through many scenes that things somehow turnout the way we want them to. Although you can see it coming, the events of this tale entwine beautifully, leaving not one hanging thread. Fantasy fans will especially love the old versus beautiful Magna, and many small touches that enrich RING OF DESIRE. It is a lovely novel..."
"In the medieval land of Hafne, Giles and Vala must join together to fight evil and remove a curse that has made the land desolate and taken the lives of many male babes. Love, magic, and evil in all its blackness, flow around Giles and Vala even as their hearts open to each other and their love builds to a white hot frequency they cannot deny. Great plot, great writing, great love between the hero and heroine. Action filled pages that keep the heart pounding sometimes with fear for the characters when evil stalks their shadows and sometimes with excitement as love develops. Not being an avid romance reader did not stop this story from grabbing my attention with the first few paragraphs, and I'm still caught. I love all the action starting at the beginning, the mysteries, the magic, the sense of danger that the villain brings with him. Ryshia Kennie has done a superb job keeping my attention from beginning to end. When life forced me to stop reading, I couldn't stop thinking about the story until I had the opportunity to return to reading it. Read the book. You'll be happy if you do."